The ghosts of elections past have an uncanny way of stirring up controversy, and this year is no different. The newest 2016 election viral video making waves is an uncanny blast from the past: It's a vintage campaign ad from the 1964 election. Despite being called "Confessions of a Republican," this ad was produced by the Democratic National Committee for President Lyndon Johnson's 1964 election campaign against Arizona Republican Barry Goldwater. Following the assassination of President John Kennedy in 1963, the Texan senator ascended to the White House. Finding himself in a similar situation to Frank Underwood in House of Cards or Selina Meyer in Veep, Johnson had to run for president while being a current, yet unelected, resident of the Oval Office. Johnson waited until the DNC convention in the summer of 1964 before even officially announcing his candidacy. Knowing full well the importance of the television — an emerging new medium of mass communication — to the political conversation (think back to the Nixon-Kennedy debates), Johnson and the DNC called on Madison Avenue advertising powerhouses to create a series of long-form commercials. This particular ad is part of campaign season where the American public saw the nightmare-inducing "Daisy" ad, which equated Goldwater's election with nuclear holocaust, and a not-yet-elected, young Ronald Reagan saying he "boils over" when people diss his good friend Barry Goldwater. And despite being from 1964, the "Confessions of a Republican" video reminds us in 2016 that if we don't learn from history, we're doomed to repeat it. Let's take a look at the optics of the "Confessions" ad. The piece features a bespectacled young white man smoking a cigarette giving a monologue to the camera. Wearing a tailored grey suit, Oxford shirt, cuff links, and a tie with just a hint of a sheen to it, the costuming wouldn't be out of place in a boardroom or at a bank. This is designed for a specific purpose: to get the target audience to relate to the actor — and therefore the message — as if he were a colleague, friend, classmate, or fellow churchgoer. Most of all, someone they could respect and trust. "I certainly don't feel guilty about being a Republican," the actor begins. "I've always been a Republican. My father is, his father was. The whole family is a Republican family." Extolling his Republican pedigree as a way to further connect with the target audience, he then goes on to say how he's voted: Eisenhower the first time, Nixon in the most recent election. Then: an exaggerated pause. He brings his hands together, and leans into the camera. "When we come to Sen. Goldwater, now it seems to me that we're up against a very different type of man." This is an incredibly cleverly constructed sentence. It establishes an "Us vs. Them" dynamic from the get-go by making the assumption that the audience is already against Goldwater — saying "we're up against" instead of taking the tone of a more neutral observer, or commentator. This establishes a conflict, while claiming that Goldwater is definitely not representative of "normal" Republicans. Then, pathos introduced. The actor throws his hands up, framing his face and says: "This man scares me," and then brings his hands down, almost as if he's admitting defeat. He then immediately qualifies his statement by saying "Now maybe I'm wrong," and going into a bit about what his friend told him about campaigning vs. governing. "Listen, just because a man sounds a little irresponsible during a campaign, doesn't mean he's going to act irresponsibly." Here is where it becomes incredibly relevant to today's campaign. That's about the only talking point left that could have any resonance with undecided Republican voters in 2016, or during a general. The kicker: "When the head of the Ku Klux Klan, when all these weird groups come out in favor of the candidate of my party, either they're not Republicans, or I'm not!" The truth level in this statement may be just too damn high for many of today's GOP voters to handle, especially after Trump's resounding victory in Michigan last night. 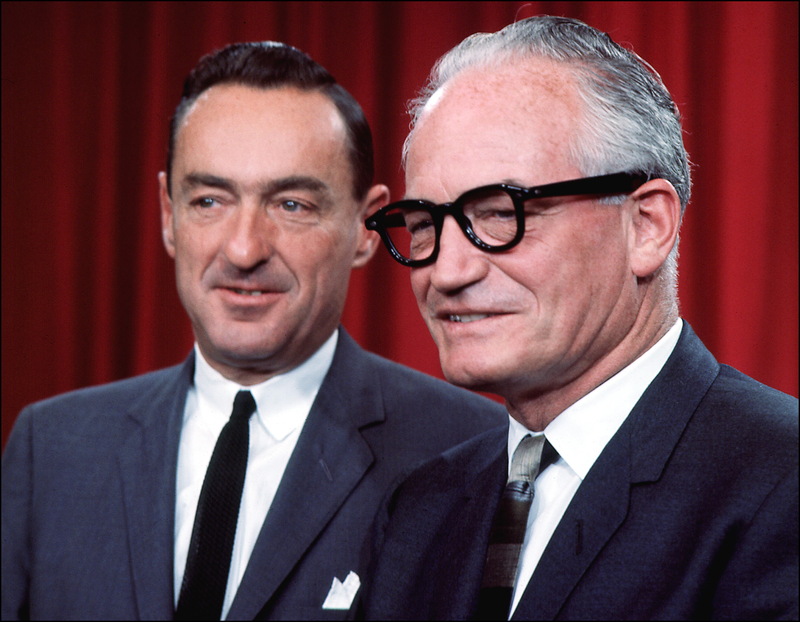 Perhaps it is a good thing to remember that while the GOP has been at this juncture before, last time, the overtly racist, segregationist Goldwater was soundly defeated by Johnson in both the popular vote and the Electoral College. Watch the full ad, clocking in at just over four minutes, below. There still is time for the Republican Party to come to its senses and nominate someone who repudiates the toxic rhetoric that He Who Must Not Be Named has been advocating, but it looks as if that time will come this summer during a brokered convention, and not from GOP voters. The question now seems to be whether it will be evangelist Texas Sen. Ted Cruz, Florida Sen. Marco Rubio, or former Managing Director at Lehman Brothers/Ohio Gov. John Kasich on the top of the ticket.